How did the term originate? 'Arms' here derives from the use of the word for the tools—the weapons and armor—of an armed man. This term was extended to the design a warrior painted on his shield and the crest he displayed on his helmet so he could be identified by his peers and followers in battle; arms in this sense thus came to proclaim a man's status as a member of the dominant military class; arms soon became hereditary and thus declared not only his personal identity but his lineage. On ceremonial occasions an 'armiger'—a man entitled to bear hereditary arms—wore over his ordinary dress a garment which displayed his arms; this 'coat of arms' eventually became the term for any full display of arms, including not only the designs on the shield and crest but also ancillary symbols of his family and rank, such as 'supporters' (the falcons in your image) and a slogan. 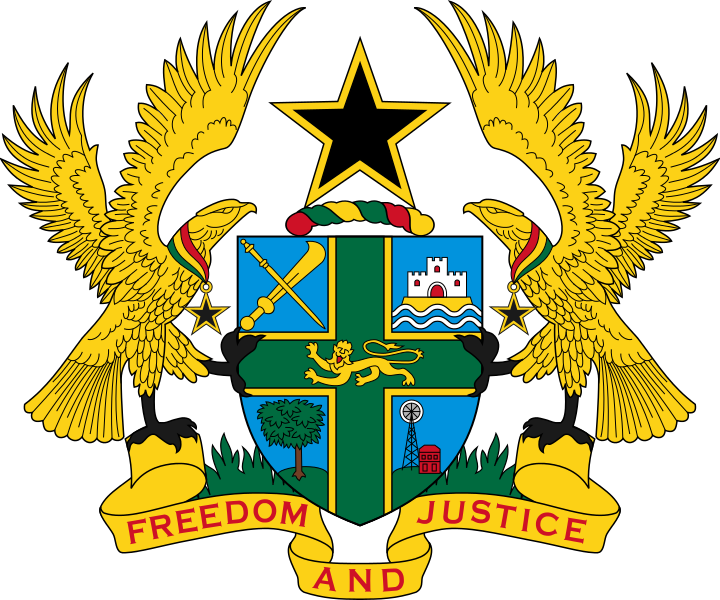 For those who enjoy the ancient craft, here's my own blazon of the arms of Ghana depicted in OP's illustration. I take the cross to be the principal charge on an unvaried field, but there's room for argument there. Azure, on a cross vert fimbriated or, a lion passant gardant or; in dexter chief, an asante sword and an oykeame staff or in saltire; in sinister chief, on a rock or emerging from a ocean barry wavy argent and azure, Osu Castle argent windowed and gated gules; in dexter base, on a hillock vert a cacao tree proper; in sinister base, on a hillock vert a gold mine proper. For a crest, on a wreath gules vert and or, a mullet of five points sable fimbriated or. For supporters, two tawny eagles or rousant with wings addorsed; about the neck of each, on a riband gules vert and or, a mullet of five points sable fimbriated or. For a motto, gules on a scroll or, Freedom and Justice. Not the answer you're looking for? Browse other questions tagged meaning phrase-meaning etymology or ask your own question. Why does 'wilful' = 'willful' connote negativity? Why named 'deduction' and 'induction'? Why does 'disposed' mean 'inclined'? Why are setup windows called “wizard”? Why does “Hand Waving” have a meaning “omitting important details”? Any reason for being called 'Chicken Fingers', given it's not made from fingers of chicken at all? Why the hood is also called bonnet? Why does “blue” mood, means “sad mood”?